Can you watch Canelo vs. Golovkin (GGG) on Kodi? Canelo vs. GGG 2 is finally happening after numerous delays. You’ll be able to watch this match live online abroad from the US, UK, Australia, and anywhere in the world, so long as you’re using the right sources. 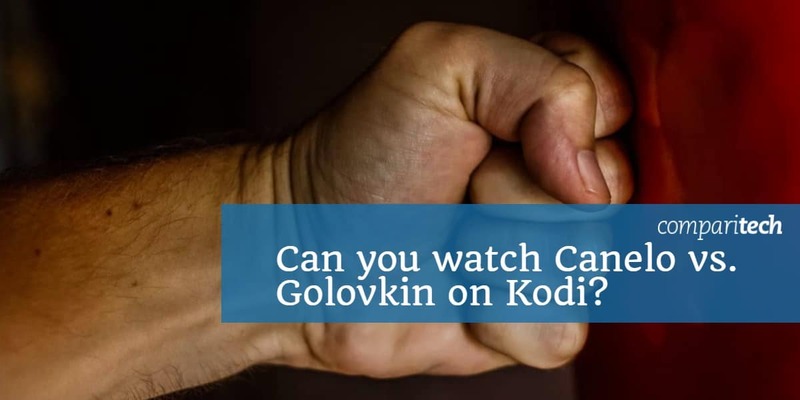 But with the September 15 fight just around the corner, can you watch Canelo and GGG on Kodi? Canelo vs. GGG 2 is being broadcast exclusively through Pay-Per-View options. For Kodi users, that means there are are no official options to watch the match, and even unofficial streaming options through Kodi are limited. Recent changes in the law now allow your ISP to share or sell your personal data to third parties. Not only does that mean ISPs can gather your data for profit, it’s an acknowledgment that your internet service provider can see all of your streaming activity. They don’t have to ask your permission to skim your data as well, as you give away this right as soon as you sign up for service. You can hide your online activities by using a VPN to encrypt your connection. Not only is your web activity hidden from outside viewers, none of your information can be shared, sold, or stolen. Of the top VPNs we’ve tested, our #1 choice for strong encryption and fast speeds while streaming online is IPVanish. HBO PPV will have the match in the US, as well as BT Sport Box Office in the UK, and Main Event (via Foxtel) in Australia. None of these options is available through Kodi from any official Kodi addons. You’re also unlikely to find them through unofficial addons. What about unofficial Kodi addons? It’s likely that some third-party IPTV addons, such as Players Klub, cCloud TV, Selfless, or Ultra IPTV may carry the match. However, there is no guarantee, and you would have to wait and see, at which point you may be disappointed and miss the fight entirely. Additionally, those options carry significant privacy, security and legal risks. Ultimately, we do not recommend them. Instead, we recommend a few potential alternatives Kodi users should consider. Depending on where you live, you’ll have a few alternative online viewing options for the Canelo vs. Golovkin fight. You will need VPN to access these stream if you want to access any of these streams outside of the county the broadcaster is based in. Options outside of the US, UK, and Australia are limited. However, you may be able to connect into one of these options from outside of the US using a VPN and proper payment credentials. IPVanish is a good option and includes a 7-day money-back guarantee. EXCLUSIVE DEAL: Save up to 60% on IPVanish plans here. Canelo Alvarez and Gennady Golovkin are set to fight it out in the ring on September 15, 2018, at the T-Mobile Arena in Las Vegas. If you’re hoping to catch the fight, be sure to tune into your desired streaming source at 8 PM EST / 1 AM GMT+1 at the start of the fight card. As the exact timing for the Canelo vs. GGG 2 fight depends on how long the other matches go, you’ll want to tune in at the 8 PM EST / 1 AM GMT+1 start time. Want to learn more about Canelo vs. GGG 2? Check out our guide on how to watch the Canelo vs. Golovkin match online from anywhere.